Muslim Brotherhood spiritual leader Sheikh Yusuf al-Qaradawi openly called for violence against Israelis Wednesday and promoted the destruction of the Jewish state on several online platforms. 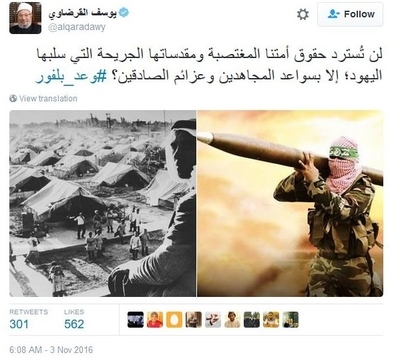 Marking the anniversary of the 1917 Balfour Declaration, which promised to create a Jewish state, Qaradawi tweeted a message inciting violence against Jews. "Will the usurped rights of our Umma [global Muslim community] and its wounded holy places the Jews despoiled be restored save by the might of the Mujahideen and the determination of sincere men? #Balfour_promise," wrote Qaradawi, according to an Investigative Project on Terrorism (IPT) translation. Invoking the term "Mujahideen" blatantly signals Qaradawi's willingness to encourage Palestinians seeking to carry out violent jihad against Israelis. The accompanying photo features a masked Palestinian terrorist preparing to launch a rocket at Israeli communities. Qaradawi also promoted an initiative outlined by the Islamic Jihad Movement in Palestine terrorist group. Among the initiative's recommendations for Palestinian leadership is "the withdrawal of recognition of the state of the Zionist entity," and "national liberation," an IPT translation of the post from Qaradawi's personal website said. For Palestinians, "the priority is to resist the Occupation," Qaradawi wrote. Terms such as "resistance" are often code words for violence against Israeli military and civilian targets. "Occupation" to Qaradawi, the Islamic Jihad and many other radical Palestinians, refers to all of Israeli territory – not limited to the West Bank and Gaza. By lending support to this manifesto, Qaradawi once again proves that the global Muslim Brotherhood movement is dedicated to the long-run erosion of the Jewish state. Despite this incendiary rhetoric, Qaradawi is falsely hailed as a moderate by Islamists in the United States, Europe and their supporters. Qaradawi has called for Muslims worldwide to take up arms against Israel on numerous occasions in the past. In 2014, he wrote: "For the sake of Al-Aqsa mosque, blood will flow, and Muslims will expend lives and money, and sons."